Cats and dogs can live together happily thanks to bObsweep PetHair, the friendly robotic vacuum who sweeps up your pets’ discarded dander. He features the most spacious dustbin in the industry at a liter large and a mop that can clean laminates and tiles. 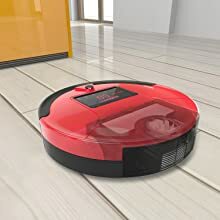 When he finds a paw print that refuses to come off the floor, Bob increases his vacuum and brushing power until the spot is wiped clear off the map. He journeys across hardwood, tile, and carpet while eliminating bacteria with his trusty UV light to give your floors a clean smile. 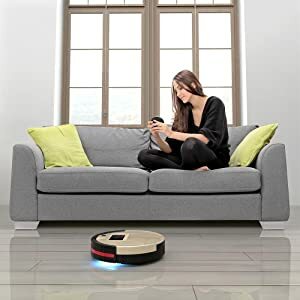 The pet that cleans after your pets! bObsweep PetHair is an elegant solution to the part of pet ownership we all like the least: the clean-up. Adopt a robotic pet who can sweep, vacuum, and mop—without any training! 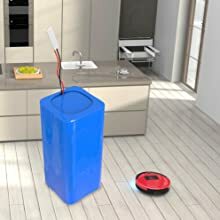 Bob’s sleek, practical design makes him a handsome and helpful cleaning companion. A whopping 7500 RPM TurboLift Motor pulls dust, dirt, debris, and hair from the deepest reaches of all carpet types. Bob combines the power of a rotating, full-contact brush with a squeegee-style dust sweeper to clear a path through dust and hair. 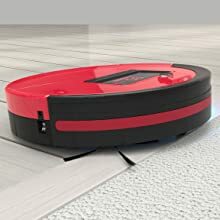 Clip on Bob’s micro-fiber cloth and he will sweep and polish your floors simultaneously, surpassing the limits of a standard vacuum cleaner. 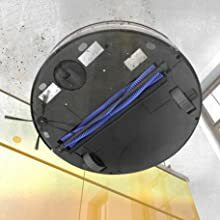 A 400 NM Ultra-Violet lamp sterilizes the floor below, while a HEPA filter removes sub-micron particles from the air around you, including mold, dust mites, and viruses. A Spring-Actuated Surface Automator adjusts Bob to match the level of any surface for maximum, continuous floor contact. Thanks to his high-capacity, quad cell lithium-ion battery, Bob works for over 1 hour and 15 minutes on a single charge. Bob’s cavernous, 1000 ML dustbin is the largest in the industry. Its three-layer filtration system prevents small particles from escaping back into the air. 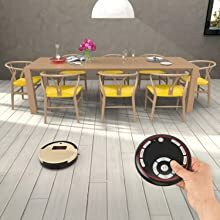 You can control Bob’s every movement and function, from his cleaning speeds to his cleaning modes, with his fully functional infrared remote. – Side brush sweeps along walls, corners, and other hard-to-reach places. – Edge sensors detect edges and drops, including stairs and platforms. 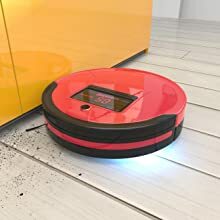 – Infrared sensors perceive and avoid objects along Bob’s cleaning path. – High-sensitivity dirt sensors alert CPU to focus on a soiled area. – RoHS Compatible: no materials harmful to humans, animals, or the environment were used in any component. – OBD-R (On Board Diagnostics Robotic): self-checks all components for proper functionality and reports potential errors. – Automatic charging: returns to charging station when battery falls below 15%. – Large, interactive 5×3 inch LCD screen. – Charging Station and Charging Adapter (110V/240V compatible). – X-AMPlified Lithium-Ion 2200 mAh Battery (installed). – Mop Attachment and Micro-Fiber Mopping Cloths x 2. – Side Brushes x 2. – Additional Blue Main Brush. – Additional HEPA Filters x 2. – Blindfold and Bumper Stickers. – Maintenance Tools (screws and Phillips head screwdriver). – Owner’s Manual and Quick Start Guide. 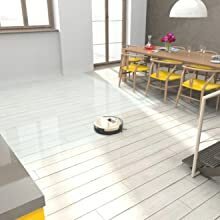 In Bob’s three cleaning modes, he will navigate through a room using sophisticated Waffle TrackTM, Wall TrackTM, and Spiral TrackTM technologies. 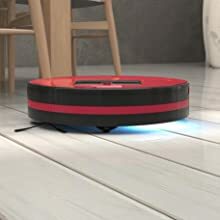 Robot / Auto Pilot: automatically maneuvers across all surfaces for a thorough clean; docks to charging station when battery falls below 15%. Quick Clean: automatically maneuvers across a medium-sized area for a quick and efficient clean; goes on standby mode after 30 minutes. Touch Up: automatically maneuvers across a small area for a speedy touch up; goes on standby mode after 15 minutes. Here at bObsweep, we want to ensure that your purchase of Bob remains among the best decisions you have ever made. It is therefore our priority to provide you with exemplary service and support. Once you purchase Bob from an authorized retailer, you are entitled to a 30-day money back guarantee, 1-year warranty, 5-year subsidized repair, and unlimited lifetime after-sale support. Receive a genuine bObsweep that is unused, unmodified and sealed with care by avoiding third-party, unauthorized retailers. If You wan to Get it NOW from trusted webstore AMAZON.COM, You will get benefits.